Wheat has been cultivated for over 10,000 years because of its nutritional value, but it also possesses a range of surprising health benefits. Humans first began to cultivate wheat over 10,000 years ago, making it one of the first plants ever to be intentionally farmed. It spread all over the world from its natural habitat in the Middle East, and it is now one of the most widely-grown crops in existence. It remains a staple of many diets, but it has also been shown to benefit health in several key ways. Reducing chronic inflammation. Wheat prevents certain amino acids from causing inflammation in blood vessels and other parts of the body. Improving cardiovascular health. Eating wholegrain wheat can provide particular health benefits for the heart. Regulating hormone levels. The consumption of wheat can help to keep certain hormones, particularly estrogen and insulin, at normal levels. Wheat contains a chemical compound called betaine, which is instrumental in reducing chronic inflammation, especially inflammation of blood vessels. Betaine alters the structure of certain amino acids to prevent them from causing bodily inflammation. The supply of phytonutrients and lignans in wheat have been shown in studies to promote heart health, although the exact mechanisms are not yet fully understood. Lignans can also bind to certain hormone receptors in order to prevent an overabundance of estrogen in the body. Magnesium regulates certain hormones as well; it interacts with several different enzymes to promote the secretion of insulin in the body. Cardioprotective properties are also present in olive and tomato, whereas oregano and turmeric can provide similar anti-inflammatory benefits. For most people, wheat has no side effects. 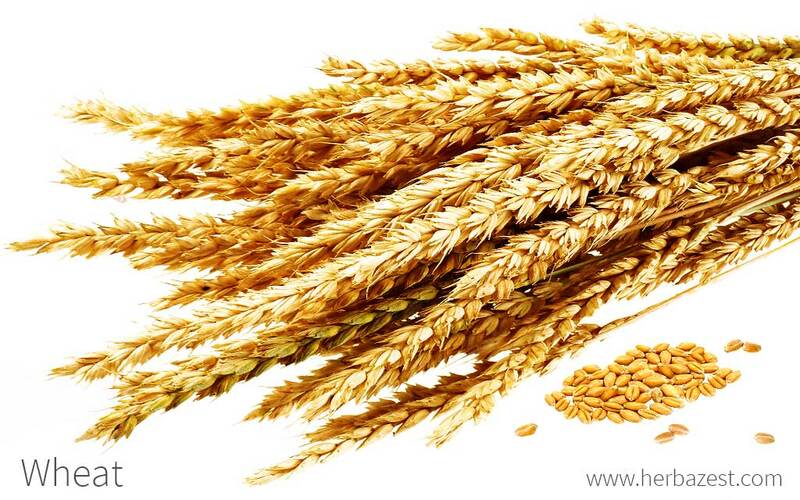 However, wheat contains fructan, a fructose compound that triggers allergic reactions in sensitive people. In some cases, fructan gets fermented in the intestines instead of being properly digested, which causes symptoms such as bloating, wind, gurgling, and abdominal pain after consumption. For reasons that are yet to be known, some people have wheat allergy and experience symptoms from skin rash, stomach discomfort, nausea, and runny nose to headaches, asthma attacks, and anaphylaxis after having contact with it. The only way to manage this kind of allergy is to avoid foods and other products that may trigger these symptoms. Wheat also contains gluten, a protein found in some grains, particularly wheat, barley, and rye. It is responsible for the elasticity of bread dough and for the spongy consistency of most baked goods, but it can also trigger allergic reactions in some individuals, and it should be avoided in those cases. AN ESPECIALLY COMMON REACTION TO WHEAT IS CALLED BAKER'S ASTHMA, AND IT CAUSES SHORTNESS OF BREATH OR WHEEZING WHEN WHEAT FLOUR IS INHALED. Celiac disease. In this autoimmune disorder, which is genetic in nature, the ingestion of gluten leads to damage of the small intestine. Non-celiac gluten sensitivity. This is different from gluten allergy, and its cause is yet to be understood, but it triggers similar symptoms to those of celiac disease. In both cases, the symptoms may include stomach pain, eczema, headache, “foggy mind,” joint pain, and numbness in the legs, arms, or fingers. The only way to treat these conditions is to stay away from wheat, rye, and barley. Wheat-dependent exercise-induced anaphylaxis (WDEIA) is a less common but well-documented syndrome; for those suffering from WDEIA, exercise after ingesting wheat may cause anaphylaxis. THERE ARE NO KNOWN MEDICAL INTERACTIONS WITH WHEAT, MAKING IT SAFE TO TAKE WITH ANY MEDICATION. Wheat is rarely consumed in any preparation that is not culinary, but a derivative of wheat called wheatgrass can be found prepared in as an herbal remedy. Raw. The young shots of wheat are called wheatgrass, and are a popular way of reaping the medicinal properties of the herb. They can be used in salads, added to smoothies, or juiced. Cooked. Wheat is usually eaten cooked, and there are many different recipes and dishes available. Powder. When wheat is finely ground, its becomes a powder, which is commonly called wheat flour. Breads, pastas, and other baked goods are by far the most common preparations using powdered wheat. Eating whole wheat provides all of the many health benefits that this staple food has to offer. Capsules. The extract of wheatgrass can be found in supplemental forms that can be taken in standardized doses. Wheatgrass preparations provide health benefits that are similar to those of wheat, but because it is only grown from a part of the wheat plant, it may not provide the same range as wheat grains. Wheat flour and other products made from wheat can be found around the world in grocery stores, local markets, and bakeries. They can often also be found in small convenience stores or nearly any shop that sells basic food items. Wheatgrass juice is most likely to be found at juice bars. Supplements made from wheatgrass are sold commonly online and in health food stores, but can also be found in some vitamin stores. Wheat is commonly thought of as an agricultural plant not suited for home growing, but it can be successfully cultivated in a side garden or backyard. It requires full sun and a sandy, well-drained soil, ideally with a pH from 7.0 - 8.5. For each 100 square feet (30 m2) of garden area, there should be approximately 6 - 10 ounces (170 - 283 g) of seeds. The seeds must be sown one inch (2 cm) deep in the earth and in rows, spacing them one inch (2 cm) apart. Wheat is ready to harvest when the stalks turn from green to golden, yellow, or brown and when the grains become crunchy. Wheat is a tall, thin annual grain that can reach a height of two to four feet (60 - 120 cm). The majority of the plant is the long vertical stem. The leaves are long and thin, like the stem, and generally a total of eight or nine leaves appear on each plant. Flowers emerge near the top of the plant and change from green to yellow once they have been pollinated before eventually maturing into the wheat kernel, which is the part of the plant harvested for wheat consumption. Wheat is a member of the Poaceae family and, within that, the Pooideae subfamily. This family contains several different species of flowering grasses, Including economically important crops like barley (Hordeum vulgare), maize (Zea mays), oat (Avena sativa), and rice (Oryza sativa). Two main species of wheat are currently grown for human consumption: common or bread wheat, Triticum aestivum, and durum or pasta wheat, T. durum. T. aestivum makes up 95% of the wheat used in human food. Several other species of wheat exist, but none are as widely grown as these. Over 12,000 varieties of wheat exist within these two species; most are classified as being either hard or soft and red or white. Hard red types are often used for making bread, whereas soft white varieties are better for pastries. Wheat can also be classified according to whether it is planted in the winter or the spring. Wild wheat grows naturally in the region of the Middle East called the Fertile Crescent, and it was first cultivated over 10,000 years ago in what is now Turkey. It traveled through Anatolia and Greece to reach Europe 8,000 years ago, and 3,000 years later, it finally spread throughout the continent and reached the United Kingdom. It traveled to Asia approximately 2,000 years later, but only reached Australia and the Americas in much more recent history, when European colonies were established on each continent. Wheat is one of the world's most important crops. It is grown for both human consumption and livestock feed, so demand for wheat is high. Wheat, rice, and maize are referred to together as the big three cereal crops, and over 600 million tons of each crop are harvested each year. China, the European Union, India, Russia, and the United States are the top wheat producers in the world. Baked goods, generally bread, made from wheat play an important role in many religions. One of the best known ceremonies involving bread is the Christian sacrament of communion, in which the bread takes on a ceremonial role as the body of Christ. Similarly, matzah, an unleavened bread product made from wheat, is an integral part of the Jewish festival of Passover. Several lesser-known ancient religions from the area around Uzbekistan and Kurdistan taught that bread was sacred because of its connection to the goddess of wheat. Although those religions are no longer widely practiced, many people living there still follow old traditions, such as never letting bread fall to the ground and not throwing it out in public. Cosmetics. An oil extracted from the wheat kernel, wheat germ oil, has been gaining some popularity in the cosmetic industry. It is thought to be beneficial for hair, nails, and skin. As one of the biggest annual crops worldwide, wheat is widely available in all of its many forms. Its many medicinal properties, especially its ability to reduce inflammation and regulate hormones, make it an excellent addition to many diets. Celiac Disease Foundation, What Is Celiac Disease?